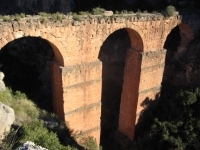 The impressive remains of the "Peña Cortada" aqueduct are found west of Valencia, along the main road CV 35 from Lliria to Tuéjar. The aqueduct dates from the end of the first or the beginning of the second century AD. 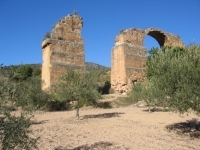 The source of the aqueduct was probably shortly north of Tuejar at an altitude of 600m, at the 'Azud del Rio Tuejar', where a roman dam was probably situated which was the source of the aqueduct. From here, the roman aqueduct, modified over the ages, is still in use as the "acequia madre" (main water conduct) of Chelva. Of the aqueduct the first aqueduct bridge can actually be seen halfway between Tuejar and Chelva on the west side of the road in the 'Barranco del Convento'. It is massive with a single small arch, rebuilt in later times but one supporting pillar is original roman. It is 3,5 m high, and 2,6m wide. This aqueduct bridge collapsed in 2001 and was recently rebuilt. It carries the modern water channel, which can be seen on the east side of the road where one may park a car. 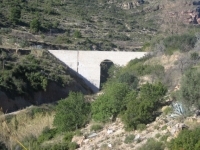 From here, the aqueduct runs just north of the main road to finally reach another small roman aqueduct bridge at the "Fuente de la Gitana" (spring of the gypsy girl) at 520m altitude, north of Chelva. From here, the trace of the aqueduct is less easy to follow since the downstream part is no longer in use. 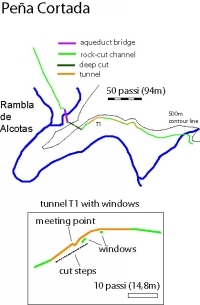 However, the most spectacular engineering works of the aqueduct, not touched by more recent repairs and modifications, are in this downstream part, culminating in the bridge and tunnels of the Peña Cortada (see map). Unfortunately, the aqueduct is difficult to follow after this point. It can be followed down to the village of Domeno but no further. Possibly, the aqueduct served the roman town of Lliria. The quality of the work and the costs that must have been involved in building it, make it likely that is was meant to serve a major town. I estimate the exposed length at about 16 km, with a difference in altitude of 100m. 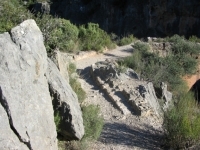 Between Fuente de la Gitana and the Peña Cortada the difference is 20 m over approximately 3 km, giving a gradient of 0,06%. 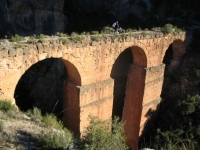 The Peña Cortada section of the aqueduct is NE of the town of Chelva. It can be reached from Chelva on foot as indicated on the map, or by car as follows. Drive north from Chelva on the road to Ahillas (CV346), and turn right after about 600m, shortly after passing the bullring along a dirt tract that is well signposted. 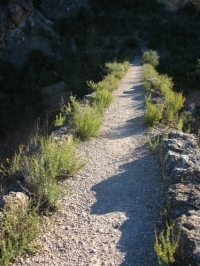 Eventually, the track reaches the first visible part of the aqueduct, an aqueduct bridge of six arches which was built over the "Rambla de Alcotas" (A rambla is a creek that is dry in summer). One arch and one pillar of this bridge are still standing. 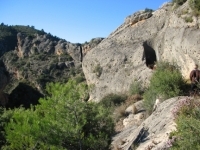 After another 400m the car can be parked at a picknick spot with some pine trees, from where a track can be followed uphill to the north, which then reaches the remains of the specus of the aqueduct at an altitude of approximately 500 m. This is followed to the east, and along this section several rock-cut sections are visible. 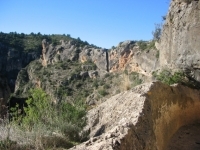 After the aqueduct makes a dogleg to the north, one reaches the spectacular aqueduct bridge that was built over the gorge of the "Cueva de Gato" (cave of the cat). The coordinates are 39° 45.261' N, 0° 58.170' W. The bridge is well preserved, has three arches, is 18 m high and 38,3 m long (125 roman feet). It is constructed from blocks of stone extracted from the tunnels of the same aqueduct complex. Passing the bridge, a spectacular section of rock-cut sections and tunnels can be seen. After the bridge, the engineers who built this section decided to make a nearly 20m deep cut through a rock in order to shorten the track of the aqueduct. 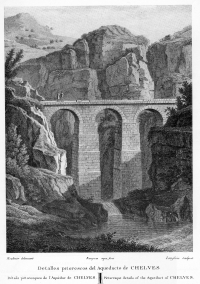 Another reason to make this cut was probably to provide stones for the aqueduct bridge; the volume of rock excavated is close to the amount needed for the bridge, and the rock cut has a very regular width which would not have been necessary at this remote spot. Bridge and rock-cut were therefore probably made at the same time. The rock cut is 23 passi long, with a central short tunnel of 3 passi. 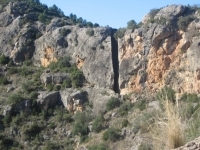 This spectacular cut in the local limestones is reflected in the name to this spur of rock; Peña Cortada (cut mountain). 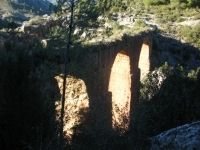 After the Peña Cortada, the aqueduct had to pass a very steep, nearly vertical section of a massive limestone cliff along a gorge of the Rambla de Alcotas. This section was engineered beautifully trough a series of five tunnels, connected by rock cuts that created a 4 feet wide gutter in the cliff with a low rock wall on the side of the gorge. The first section, just after the steep cut had to be supported by a low wall on the side of the gorge, remains of which are still visible. After that, the gutter -tunnel section starts. 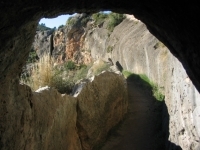 The tunnels are half-elliptic in shape, are 5-6 roman feet (1,5-1,9) metres high, and have a width of 4 feet (1,2 metres). It is clear that here, where there was no need to extract building stone, the shape of the tunnels is not straight in the upper segments. Although the rock wall is locally steep, the need for tunnels instead of rock-cuts is not immediately obvious. 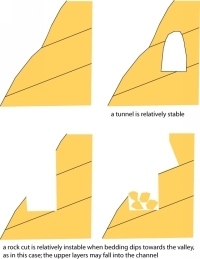 Tunnels are generally more labour intensive and more difficult to make, especially close to an irregular rock wall. The need for tunnels, however, is probably related to the local geology. Bedding in the limestones is locally not horizontal, but steeply south-dipping, into the gorge. 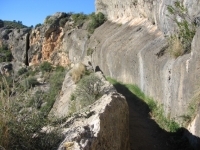 Bedding planes in rocks are normally planes of weakness, which means that a vertical rock wall or cut made along the side of the gorge would be badly instable; the higher rock layers threaten to fall into the channel (see drawing). This may have been one of the reasons why the engineers decided to put in a large number of tunnels, especially where the slope was steep. At such sites, a channel would have been more work than a tunnel, anyway. Most spectacular is the first tunnel (T1 on the map) which has two windows on the gorge. Just west of the first window, it is possible to recognise a nice meeting point where tunnel, dug from west and east met. 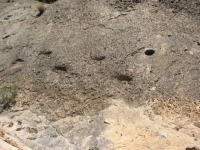 At least the western window seems to have been made on purpose; outside the tunnel and below the window it is possible to recognise steps cut out in the rock, and holes that were probably used to anchor ropes and wooden work platforms. From the placing of the steps it is likely that the work crew made the steps to reach the site of the first window, and started the tunnel from there digging west, and from the Peña Cortada digging east until they met. The other tunnels, which regularly alternate with rock-cut sections, may have been dug the same way. It is possible to walk through gutter and tunnels to a small creek where the trace of the aqueduct is lost. 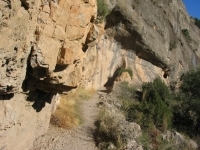 From here, one can return to the car or continue walking south along the river to eventually reach the main Valencia - Chelva road east of Chelva. This unique piece of roman engineering is definitively worth visiting, and further investigation would probably reveal much about the way the roman engineers tackled the difficult problems. Observations Cees W. Passchier, 2005.